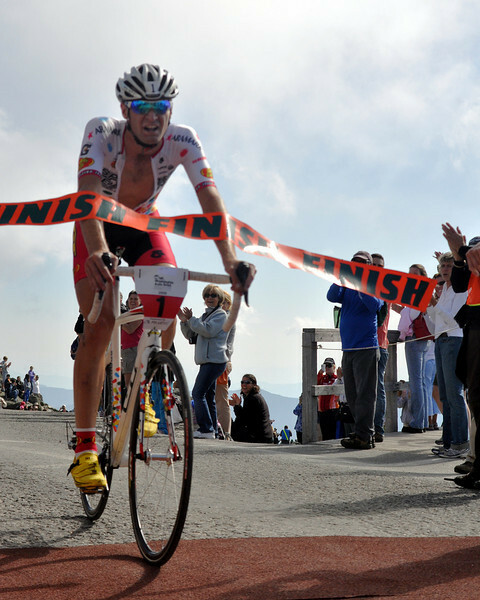 Philip Gaimon, 23, of Tucker, Georga, breaks the tape at the finish of 2009 Mt. Washington Auto Road Bicycle Hillclimb, winning the grueling 7.6 mile race for the second year in a row, with a time of 54.37. Taking second, 16 seconds behind, was Ned Overend, 53, of Durango Colorado, with a time of 54:53.